Layers of the cornea. Credit: Unite for Sight. The cornea is the transparent, dome-shaped layer that covers the front of the eye. It is a powerful refracting surface, providing 65-75 percent of the eye's focusing power. The cornea also protects the eye, helps shields it from undesirable elements like germs and dirt, and filters out some ultraviolet light. It shares this protective task with the eyelids, the eye socket, tears, and the sclera, or white part of the eye. Because there are no blood vessels in the cornea, it is normally clear and has a shiny surface. It is also extremely sensitive – there are more nerve endings in the cornea than anywhere else in the body. The adult human cornea is only about 0.5 millimeter thick. The cornea is comprised of five layers: the epithelium, Bowman's membrane, the stroma, Descemet's membrane, and the endothelium. The epithelium is a layer of cells that cover the surface of the cornea. It is only about 5 to 6 cell layers thick, comprising about 10% of the cornea's total thickness, and filled with tiny nerve endings. The epithelium quickly regenerates when the cornea is injured. If the injury penetrates more deeply into the cornea, it may leave a scar. Scars leave opaque areas, causing the cornea to lose its clarity and luster. The epithelium is filled with thousands of tiny nerve endings that make the cornea extremely sensitive to pain when rubbed or scratched. The epithelium blocks the passage of dust and germs and provides a smooth surface that absorbs oxygen and cell nutrients from tears, and then distributes these nutrients to the rest of the cornea. The basement membrane is the part where the epithelial cells anchor and organize. Boman's membrane lies just beneath the epithelium. It is transparent and composed of strong layered fibers of collagen. Because Boman's membrane is very tough and difficult to penetrate, it protects the cornea. Once injured, Bowman's layer can form a scar as it heals. If these scars are large and centrally located, some vision loss can occur. The stroma is the thickest layer of the cornea and lies just beneath Bowman's membrane. It consists primarily of water (78 percent) and collagen (16 percent), and does not contain any blood vessels. The tiny collagen fibrils of the stroma run parallel to each other. This special formation of the collagen fibrils gives the cornea its clarity, strength, elasticity, and form. 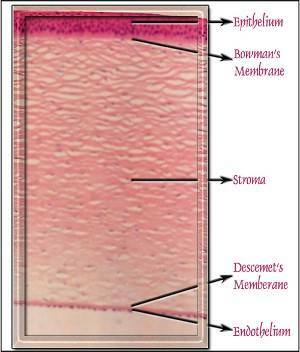 Descemet's membrane lies between the stroma and the endothelium. It is a thin but strong sheet of tissue that acts as protection against infection and injuries. Descemet's membrane is composed of collagen fibers (different from those of the stroma) and is made by the endothelial cells that lie below it. Descemet's membrane is regenerated readily after injury. The endothelium is just underneath Descemet's and is only one cell layer thick. This layer pumps water from the cornea, keeping it clear. In a healthy eye, a perfect balance is maintained between the fluid moving into the cornea and fluid being pumped out of the cornea. If damaged or diseased, the cells of the endothelium will not regenerate. Too much damage to endothelial cells can lead to corneal edema (swelling caused by excess fluid) and blindness ensues, with corneal transplantation the only available therapy. Tiny vessels at the outermost edge of the cornea provide nourishment, along with the aqueous and tear film.